We are proud to announce that this Mar 29th, 2:00 PM to 4:00 PM we will be hosting an Open House at 456 Moberly in Pacific Cove in the False Creek neighborhood, Vancouver. This is an opportunity to visit this excellent Condo for sale in beautiful False Creek. I just sold this Condo at 2302 108 W Cordova, Vancouver, BC Gastown. I just sold this at 36 7388 Macpherson, Burnaby, BC Metrotown. Real Estate Report: End of the Foreign Money? 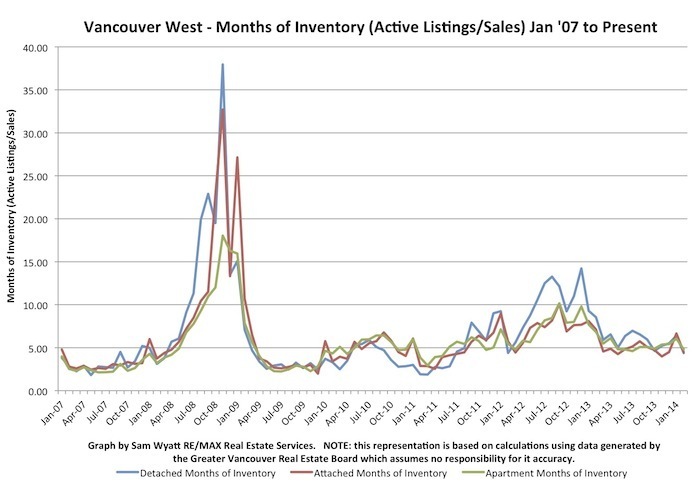 Months of Inventory (MOI) for Vancouver West real estate dropped below 5 months for all home types in February. December, January and February have all been good months for Vancouver Westside sales. These winter months are generally times when active listing volumes are at their annual low points. The result has been a tight market for the start of 2014. Will it continue?